Onion goggles?? And more kitchen tools you didn’t know you needed. Most dads who own a grill already have the essential grill tools too. But does Dad have a chimney starter or a grill basket? Does his grill brush need replacing? These are good questions to ask my mother the next time we talk. 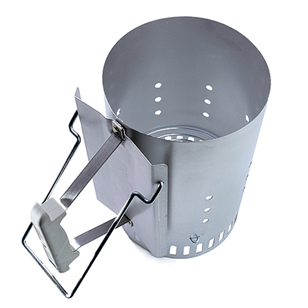 A chimney starter ($14.99) makes starting a charcoal fire a breeze. Just place crumpled paper in the bottom of the chimney, fill it with charcoal and light the paper. In about 20 minutes the coals will be ready to spread evenly in the bottom of the grill—no kindling, no lighter fluid, no perfect pyramid required. Which is better to cook with: gas or charcoal? Get the answer in our 13 Essential Tips for Healthy Grilling here. A grill basket ($9.99-24.99) is useful for foods that might fall through the grill rack or are too cumbersome to turn over one by one (vegetables, fish, tofu, fruits, etc.). Help Dad use his new tools with these quick grilling recipes. Here’s why Dad will love it: slow-cooker meals practically cook themselves—all you have to do is put the ingredients in the pot, set it and forget it. He can even make favorite summer meals like Barbecue Pulled Chicken in the slow cooker without ever having to turn on the stove! The EatingWell Test Kitchen’s pick is this affordable, programmable 6-quart Smart-Pot Slow Cooker from Crock-Pot ($70). Finally a great gadget to help Dad kick his sugary soda habit. Now he can make his own sparkling water—great for mixing or just plain drinking with a slice of lemon. The Sodastream ($99.95 and up) carbonation system allows you to make seltzer or soda using only tap water. He’ll save about 300 aluminum cans before needing to replace the machine’s carbonator. Stay cool with these Bourbon-Cherry Seltzers and more refreshing summer drinks. EatingWell Associate Food Editor Carolyn Malcoun can’t say enough about this cool tool. Here’s her glowing review from EatingWell Magazine: “After testing the Cooper Cooler ($79.99), I immediately thought of how my life would change. No more bottles of beer exploding in the freezer. My wine-tasting parties will be infinitely easier—without fail, people bring bottles of white still at room temperature, and I never have enough ice to chill several bottles in the sink. Now all I’ll have to do is add two trays of ice along with some water to the cooler, pick a setting on the nifty dial, and my wine, beer or seltzer will be at the right temperature in just minutes. Another nice feature for younger dads: the Cooper Cooler warms liquids—say, baby bottles—too; just add hot tap water to the reservoir.” For a list of retailers, go to coopercooler.com.